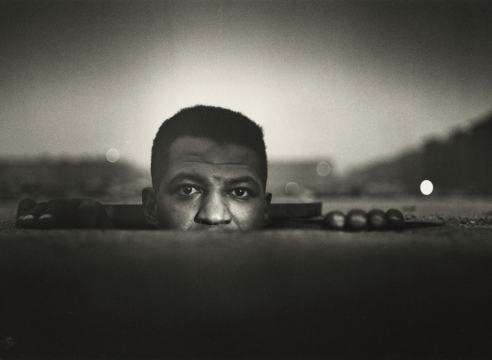 Howard Greenberg Gallery is pleased to announce a retrospective exhibition of one of America's most distinguished artists, Gordon Parks. Photographer, filmmaker, poet, writer and composer, Gordon Parks represents one of the most inspiring and accomplished figures of our time. Now in his 93rd year, Mr. Parks continues to produce, create and share moments from his lifetime and this exhibition will set out to celebrate many of his career’s most moving and powerful photographic works. As one of the most prolific and diverse artists in contemporary America, this exhibition will present images from throughout Mr. Parks’ photographic career. After winning a fellowship for his documentary photography in 1941, Parks joined Roy Stryker at the Farm Security Administration in 1942 in Washington DC where he recorded the social and cultural conditions during the Depression. There he made one of his most iconic images “American Gothic” – a portrait of Ella Watson, a black woman with mop and broom in hand standing before the American flag.